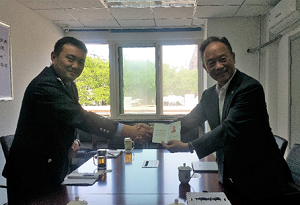 On the afternoon of April 28, Steve Ting – the Vice Chairman and Chief Representative of the Shin Shin Educational Foundation – and his colleagues visited Beijing Overseas Non-governmental Organization Management Office. 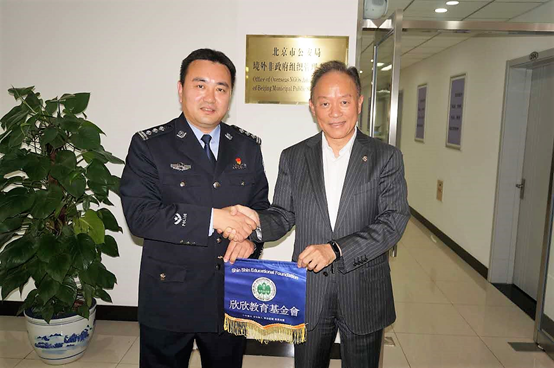 As a courtesy visit, Chairman Ting, on behalf of the Shin Shin Educational Foundation, thanked the Beijing Public Security Bureau for helping Shin Shin accomplish the smooth transition and registration through the Ministry of Civil Affairs since the enactment of the “Law on the Management of Foreign Non-Governmental Organizations’ Activities Within Mainland China”. Ting said Shin Shin would continue to work together with the Public Security Bereau in the future. He also visited the reception hall of the Office. As the Chief Representative of Shin Shin’s Beijing Office, Ting accepted the Shin Shin Chief Representative Certificate issued by the Bureau on site. During the visit, the Public Security Bereau stated that Shin Shin is an overseas non-governmental and nonprofit organization with strong support from oversea Chinese communities. “Shin Shin has made a lasting impact in our memory”, said the officer, as soon as they started reviewing Shin Shin’s documentations at the Ministry of Civil Affairs around the end of last year. The office holds Shin Shin in high regards for the diligent educational charity services they have provided in the remote and rural areas of China in the past 20 years. The Public Security Bereau also stated that they would not only hope and endeavor to do the best management and service work for any non-governmental organizations in China (Beijing), and that they would also strive to provide quality service and more convenience for overseas non-governmental organizations like Shin Shin. During the course of the visit, the two parties exchanged gratitude in a harmonious atmosphere. They both recognized the importance of each other’s work as well as the importance of collaboration between each other. The Public Security Bereau also expressed their determination to provide quality management and service to overseas non-governmental organizations.